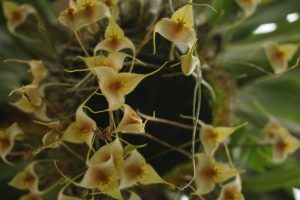 Dracula is an interesting genus and many species produce a fantastic show of flowers. Dracula deltoidea has smaller flowers than most of our other dracula species but makes up for this in the number of flowers a plant produces. 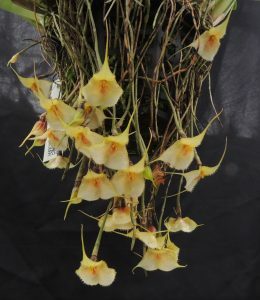 As you can see the flowers are produced downwards around and through the basket so that the best possible view is from directly underneath (below). The species is native to Ecuador and is found at elevations of 2600-3000metres so we keep it in Cool America. 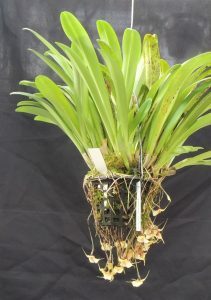 Like many druculas the leaves of this species get damaged if it gets too hot so we try to grow it very cool, wet and shady hanging below other orchid baskets.